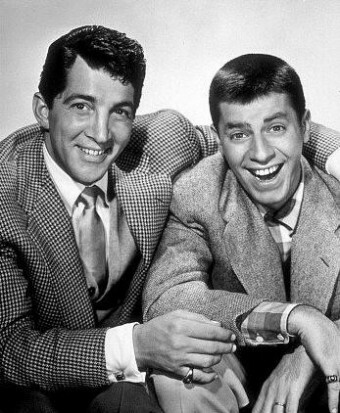 Dean Martin and Jerry Lewis formed the most electric comedy team in the history of show business. Joining together in the summer of 1946, their act caught on like wildfire. A combination of Dean Martin’s smooth, cool, baritone-voiced suave and Jerry Lewis’s incredible, creative, explosive, comedic brilliance, Dean and Jerry were the top act in all of show biz from the late forties through the mid-fifties. Finally, after 16 films (all of which made money, the pair never had a box-office flop), a TV series (“The Colgate Comedy Hour”), several radio shows, and scores of frenetic, unforgettable live appearances on stage and in clubs, Dean and Jerry decided to end their lucrative partnership. On July 25, 1956, 10 years to the day after they teamed up, Dean and Jerry officially called it quits. In September of 1958, Jerry was making a guest appearance on “The Eddie Fisher Show”. Jerry was talking about singing on the show, and in a huge surprise appearance, Dean walked in the studio while the show was on the air. “Don’t sing! Just don’t sing!” Dean said. Jerry proceeded to chase his erstwhile partner around the studio. Dean had Jerry brought to his dressing room for a drink. “Now, isn’t this better than ducking me?” Dean asked. Jerry replied “Yep,” and, “I felt pretty good about it.” Then Jerry left. “The next time he saw me, he ducked me again,” said Dean. In 1960, four years after the split, Dean and Jerry were both performing at the Sands Hotel in Las Vegas. After Dean’s closing show, Jerry made a surprise appearance on stage. Dean introduced his ex-partner from the stage. Jerry came on and the two clowned around together for 15 minutes. Dean sang “Come Back to Me” to Jerry. Jerry joined in and they sang the song together. Later in 1960, Jerry was exhausted from filming his movie “The Bellboy” in Florida and had to cancel his engagement at the Sands. Dean heard about Jerry’s problem and graciously filled in for him. In 1964, in a strange scene in show business history, the Beatles had come to Hollywood to perform a concert at the Hollywood bowl. A huge line of movie stars, including Edward G. Robinson, Kirk Douglas, Doris Day, Burt Lancaster, etc. had lined up to meet the Fab Four in person. Jerry Lewis was in the line to meet the Beatles, but when he spotted Dean Martin in the line, he quickly hurried away and left the affair. In 1976, there was the much publicized Martin and Lewis reunion on national TV on Jerry’s annual muscular dystrophy telethon. Touched by Dean’s surprise appearance, Jerry wrote Dean a letter that night and asked to see him again. He never received an answer from Dean. He kept trying, but still no answer. At this point in time, Jerry wanted to reestablish a friendship, or at least some kind of relationship, with his ex-partner. Dean, on the other hand, seemed to hold no real animosity for Jerry, but he just wanted to be left alone and to go his own way. Then came the worst day of Dean Martin’s life. On March 20, 1987, his beloved son, Dino Jr., was killed in a plane crash. (Dino was a captain in the Air National Guard.) Jerry later said, “That was the day he died.” Although Dean had seven children, Dino was, by all accounts, his special favorite (and his first born). At Dino’s funeral, a quiet, hidden figure turned up. It was Jerry Lewis, deliberately acting low-key, so as not to draw any attention. He stood at the back of the church and remained there quietly throughout the service. Dean did not at first know Jerry had been present at the service. After the funeral, Dean got word his former partner had showed up for his son’s funeral. Touched, he told an aide to get Jerry on the phone. Late that night, Jerry received a phone call. “Hey Jer”, said the very familiar voice. Jerry wanted very much to see Dean in person, but Dean preferred talking on the phone. Jerry respected that. He continued to call Dean whenever he could. Dean and Jerry had run into each other four years previously, by complete accident. In 1983, Jerry and his wife, Sam, were dining together at La Famiglia in Beverly Hills (Jerry had no idea this was Dean’s favorite restaurant). He spotted a lone figure dining at a red leather booth by the front door. Ten minutes later, a waiter brought over a champagne bucket, covered with a cloth napkin. “Compliments of Mr. Martin”, said the waiter. Jerry removed the napkin and saw six bottles of Diet Coke sitting on ice. He laughed and brought his wife over to meet his ex-partner. They chatted briefly, but both Jerry and his wife felt and understood Dean wished to be alone. In 1989, Dean was playing Bally’s in Las Vegas. On Dean’s 72nd birthday, a huge birthday cake was wheeled out by his ex-partner. Dean and Jerry hugged. The crowd went berserk as the band played Happy Birthday. “You surprised me”, said Dean, with tears in his eyes. “I love you and I mean it,” said Dean, as he hugged his old friend. On Christmas day 1995, the great Dean Martin passed on at the age of 78. Jerry did not attend Dean’s funeral. He did, though, appear at the memorial service. Jerry was asked to speak of his ex-partner and friend. A very nice, warm, article about the great comedy team after they broke up. I appreciated how the author doesn’t play either man as the villain, and each man’s attempt at reconciliation over time. Kudos to Mr. Eddie Deezen for such a well written and so so informative piece of prose on our Dino and Mr. Jerry Lewis. I learned lots of new details from Mr. Deezen’s deep Dino reflections. Know that these thoughts have been shared with all the pallies gathered ’round ilovedinomartin. How beautiful is that above reply? Wow. Well written. Thanks for providing the facts with such a straight forward narrative. Was a delight to read. What a beautiful and touching article. Thankyou. I thought I knew all there was to know about their chance encounters after their breakup, but this was so interesting and 100% believable.I ‘ve always thought the world of Dean , altho I’m only 55 yrs. old it was my dad that loved him and his music and thru him I appreciated him at a young age.. Jerry never had the kind reputation Dean had , but just the fact he’s so vocal about his love for Dean makes him alright in my book. Besides the 1976 telethon reunion, are there any photos of Dean & Jerry together after their split?